We are proud of our commitment to preserve biodiversity on the 1,019 acre Reserva Zorzal. On that land, our conservation efforts focus specifically on habitat restoration and climate change mitigation, community-based bird monitoring, and private reserve policy. Our passions for cacao, wildlife conservation, and sustainable development unite at Reserva Zorzal — a 1,019 acre bird sanctuary and organic cacao demonstration farm in the northern mountain range of the Dominican Republic. It is with great satisfaction that we are working hard to preserve biodiversity on the 1,019 acre Reserva Zorzal. What it lacks in color, the thrush more than compensates in conservation value. By migrating annually between the Dominican Republic and North America, this endangered species establishes a conservation link across hemispheres. We work to strengthen that link by uniting farmers, governments, scientists, non-profits, chocolate producers and investors behind cacao production and habitat protection for the Bicknell’s Thrush in the tropics as well as in the United States and Canada. It turns out that chocolate, a culinary force in its own right, can also be a force for international conservation! Reserva Privada Zorzal is situated in the Duarte province, in the very heart of the Dominican Republic’s cacao-producing zone. Zorzal Cacao has a long term partnership with the owners of Reserva Privada Zorzal to provide economically meaningful and ecosystem strengthening activities, including the planting of diverse tree species. The owners of Reserva Privada Zorzal, some of whom are also investors in Zorzal Cacao, have set aside 70% of this reserve be ‘forever wild’. Given the scarcity of public funds for financing conservation, we’re demonstrating how the private sector can become partners in sustainable cocoa production, and habitat protection for birds and other wildlife. Reserva Privada Zorzal is honored to be the Dominican Republic’s first private reserve establishing a model for private landowners to participate in the landscape-level conservation. On the reserve, we’re demonstrating to the world that we can grow cacao and safeguard biodiversity. It gives us great pleasure to announce that one of our Zorzal Comunitario partners, Dr. Enmanuel Camilo, also committed to designate over 865 acres, also committed to designate over 865 acres as the second Private Reserve in the Dominican Republic. 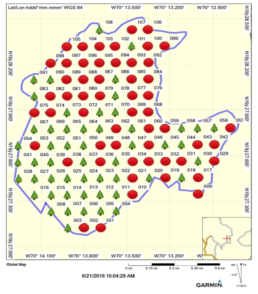 This has expanded the Private Reserve network in the Duarte Province to 2,000 acres! 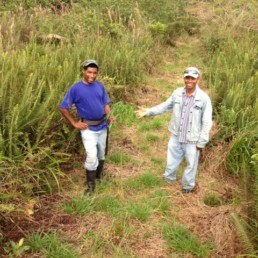 Surveyed points on Reserva Zorzal. Red points are location of points where Bicknell’s thrush were found. Similar to our cacao production, our conservation efforts are based on sound science and economics with a dash of inspirational vision and good luck. 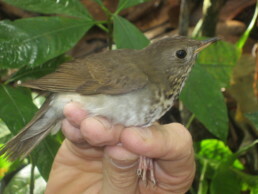 Led by Vermont Center for EcoStudies, we established our first baseline monitoring program in 2014 and encountered Bicknell’s Thrush in 19 of 107 bird count points on Reserva Zorzal, primarily in the 700 acre rainforest reserve area. We completed the second monitoring program in 2016 and encountered Bicknell’s thrush at 53 of the 107 points. Preliminary results from the two monitoring seasons suggests we’re significantly increasing habitat to support Bicknell’s thrush, and habitat for other co-occurring species. We emphasize a community-based monitoring program. Local community members and park rangers are trained by ornithologists to conduct the annual monitoring activities. The community approach provides environmental education opportunities and additional income to local stakeholders. 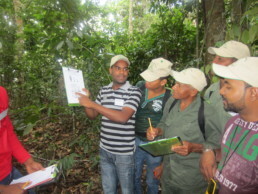 We have trained 32 community members on forest and bird monitoring protocols. Plan Vivo carbon offsets – habitat restoration and climate change mitigation. The Plan Vivo project is a long-term program that directly addresses the 50 year goal of the Conservation Action Plan for Bicknell’s thrush to increase the species population by 25%. Plan Vivo participant presents the land use plan for his property, including reforestation efforts to support Bicknell’s thrush habitat. 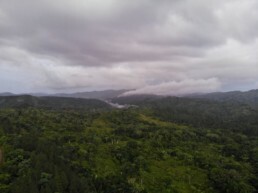 To expand conservation efforts, Reserva Zorzal partnered with Loma Quita Espuela Foundation and Consorcio Ambiental Dominicano on reforestation and habitat restoration efforts in between three Scientific Reserves – Guaconejo, Quita Espuela, and Salcedoa. The project is being third party verified and is listed under the international standard called Plan Vivo. To date, the project includes fifteen landowners who have reforested 198 acres with native tree species for Bicknell’s thrush habitat and biodiversity restoration. The unique and novel aspect of the Plan Vivo certificates is that it links farmers in the Cordillera Septentrional to chocolate companies in the procurement chain who are willing to invest in restoration activities. 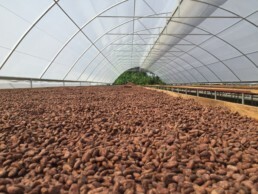 The chocolate makers who buy Zorzal cacao are willing to pay an additional value for each pound of cacao to invest in Plan Vivo reforestation efforts. 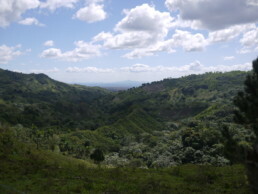 The Private Reserve regulation was signed in 2012 by the Dominican Republic’s Ministry of Environment and Natural Resources to encourage private landowners to participate in conservation. It is similar to the Land Trust or conservation easement concept in the United States, but has never been tested in the Dominican Republic. Reserva Zorzal is the first Private Reserve to be established under the regulation and is a critical case study, providing important lessons learned and policy reform suggestions. 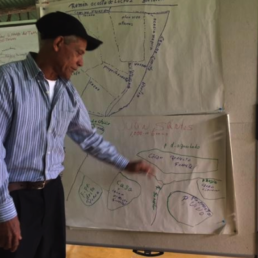 The Dominican non-profits Consorcio Ambiental Dominicano and Loma Quita Espuela are responsible for developing the management plan and working with the Dominican government to create the Private Reserve and ensure the model is replicated with other landowners.